Published: Feb. 5, 2014 at 12:48 p.m. 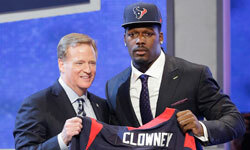 Updated: Feb. 6, 2014 at 01:42 p.m.
Change is on the way to "Thursday Night Football." It was announced Wednesday that the NFL will partner with CBS to produce and televise 16 games under the "Thursday Night Football" banner for the 2014 season. All 16 games will be produced by CBS with Jim Nantz and Phil Simms -- the network's No. 1 announcing team -- calling Thursday night games. The first eight games on CBS will be simulcast on NFL Network. The agreement is for the 2014 season with an additional year at the NFL's option. "NFL Network built Thursday into a night for NFL fans," NFL Commissioner Roger Goodell said in a statement. "Our goal is to bring these games to more fans on broadcast television with unprecedented promotion and visibility for 'Thursday Night Football' on CBS." What does this mean? Well, "Thursday Night Football" is about to get bigger. Airing eight games in prime time on television's top-rated network will be a ratings bonanza. Expect to see some premium matchups in those first eight weeks as the brand is established on a new platform. The CBS ratings surge should create momentum when NFL Network takes over in the season's back end. Many fans also will be pleased to see the return of NFL football on Saturdays, something that slipped off the grid in recent years. The only real negative on our end? This looks like the end for the Thursday night team of NFL Network's Brad Nessler and Mike Mayock, who have done quality work for the past three seasons.